A sea is a large expanse of saline water connected with an ocean, or a large, usually saline, lake that lacks a natural outlet such as the Caspian Sea and the Dead Sea. The term is used colloquially as synonymous with ocean, as in "the tropical sea" or "down to the sea shore", or even " sea water" to refer to water of the ocean. Large lakes, such as the Great Lakes, are sometimes referred to as inland seas. 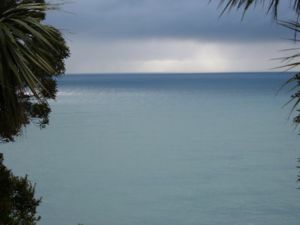 Many seas are marginal seas, in which currents are caused by ocean winds; others are mediterranean seas, in which currents are caused by differences in salinity and temperature. The International Hydrographic Organization (IHO) is the world authority when it comes to defining seas. The current defining document is the Special publication S-23, Limits of Oceans and Seas, 3rd edition, 1953. The second edition dated back to 1937, and the first to 1928. A fourth edition draft was published in 1986 but so far several naming disputes (such as the one over the Sea of Japan) have prevented its ratification. 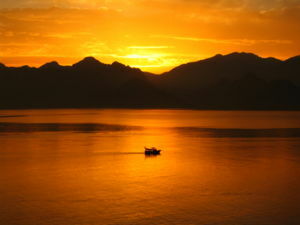 Mediterranean Sea on the coast of Antalya, Turkey at sunset. † Not listed in IHO S-23 4th ed. 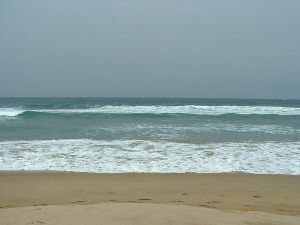 Some bodies of water that are called "seas" are not actually seas; there are also some seas that are not called "seas". The following is an incomplete list of such potentially confusing names. The Sea of Galilee is a small freshwater lake with a natural outlet, which is properly called Lake Tiberias or Lake Kinneret on modern Israeli maps, but its archaic name remains in use. The Sea of Cortez is more commonly known as the Gulf of California. The Persian Gulf is a sea. Lunar maria are vast basaltic plains on the Moon that were thought to be bodies of water by early astronomers, who referred to them as "seas". Liquid water may have existed on the surface of Mars in the distant past, and several basins on Mars have been proposed as dry sea beds. The largest is Vastitas Borealis; others include Hellas Planitia and Argyre Planitia. Liquid water is thought to be present under the surface of several moons, most notably Europa. Liquid hydrocarbons are thought to be present on the surface of Titan, though it may be more accurate to describe them as "lakes" rather than "seas". The term "sea" has also been used in quantum physics. Dirac sea is an interpretation of the negative energy states that comprises the vacuum.